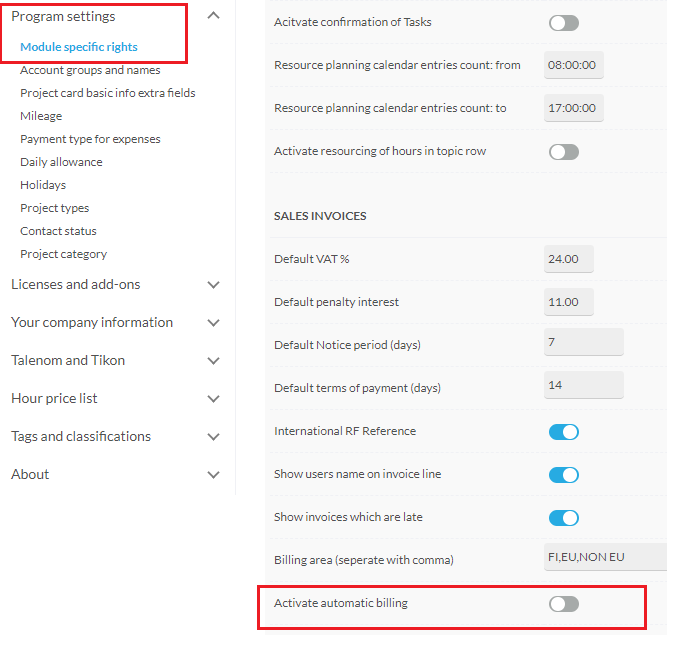 This article explains how to activate automatic invoicing feature and how to create an automated invoice. The automatic invoicing tool creates invoices and moves them automatically to Waiting status. The status means that the invoice is ready to be sent out to the customer. Taimer will automatically create the invoice but will not send it out automatically. The automatic invoicing feature can be taken advantage of in all recurring invoicing for example in license and rent payments. Please note, once the invoice is created, so is the invoice number. From an accounting point of view, this complicate things if the invoices aren't meant to be sent. When this is done, you can proceed to creating an automated invoice. After you've done the activation you can create an automatic invoice. This is done under the project card. The automated invoicing is divided into two sections, these are invoiced and billable. Area: defines invoicing area. "EU, Non-EU etc"
Cost row: you can add rows to the invoice. If you have the product catalog in use, you will be able to see that button. Bill once: If you have automated invoicing in use, you can define invoicing type for a cost row to happen only once. The one-time invoicing for the cost row will not generate to the next invoice.